The University of Granada (UGR) and the Geological Survey of Spain have proven, thanks to an analysis of the variations of the ground (subsidences and elevations), that the Vega de Granada area (Granada basin, SE Spain) sinks up to one centimeter per year during dry periods. For this, they have processed radar images obtained since 2003 by three different satellites, thus achieving millimetric precision for their study. In parallel, the exploitation of the Vega de Granada aquifer for the last 13 years has been monitored. This has allowed the researchers to know in which areas has been the aquifer exploited the most, based on the decreases and increases in the phreatic level of the aquifer. Additionally, the study includes a geological examination of the ground by interpreting a series of explorations carried out in the Vega de Granada area since the 70s. 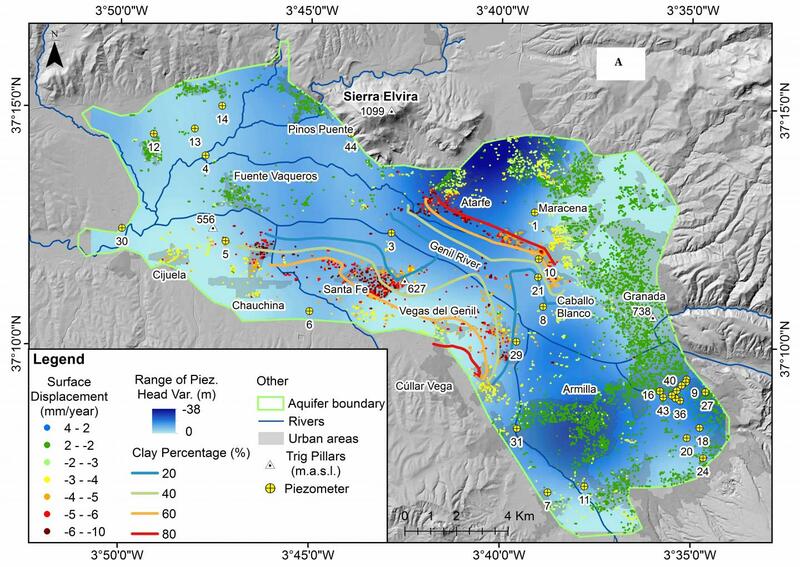 The results show that during the dry period 2003-2009 the aquifer was exploited with greater intensity in the area where the villages of Armilla, Atarfe, Chauchina and Santa Fe are located. This caused land subsidence of up to one centimeter per year in areas located north of Chauchina, the urban center of Santa Fe and east of Vegas del Genil, as well as in Atarfe and the south of Maracena. Interestingly, these areas coincide with a greater presence of clays in the subsoil, which are compacted during the decreases of the groundwater level of the aquifer. During the rainiest period, between 2011 and 2014, the foci of land subsidence disappeared, although significant subsidences of almost 13 millimeters per year were detected in the vicinity of the airport and in the urban center of Cijuela due to earthmoving works that caused land displacements in both areas. In the last years (2015-2016) only small subsiding nuclei have been detected in the northeast of Maracena, although their origin is unknown. The director of the UGR Department of Geodynamics, José Miguel Azañón, and Rosa María Mateos, from the Geological Survey of Spain, Research Centre in Granada, are responsible for this research, which has been published in Journal of Hydrology. Azañón and Mateos point out that the data obtained "are not alarming, and do not imply any risk at the moment. These data are of enormous interest for an adequate management of the aquifer, especially during periods of drought, such as the one we are currently experiencing". "In very vulnerable areas, with high content of clays, decreases of just a couple of meters in the phreatic level could cause land subsidence. An accumulation of displacements could lead to a subsidence of several centimeters per decade, which would represent a long-term danger for the villages located in the Vega de Granada area", the researchers point out. Azañón and Mateos highlight the detection of cracks in streets and sidewalks at the municipality of Otura caused by this phenomenon. "The real risk comes from differential deformations, that is, the fact that subsidence occurs in certain streets or zones and not in adjacent areas. However, most of the deformations detected are not very dangerous, since they have occurred jointly".